Newtown quarterback Luke Melillo (10) runs into Darien’s Bruce Ferguson (7) as he scrambles out of the backfield and gains enough yardage to get a first-and-goal. NEWTOWN — The reign of the Darien Blue Wave is over. The Newtown Nighthawks scored the first 16 points of the game and then held off the three-time defending champions in the second half for a 26-15 victory in the CIAC Class LL football quarterfinals Tuesday night at Blue and Gold Stadium. No. 3 Newtown (11-0) will next take on another FCIAC opponent in the Class LL semifinals, as it plays at No. 2 Greenwich (11-0) at 2 p.m. on Sunday. The Cardinals — No. 1 in the GameTimeCT poll — were 49-13 winners over New Britain in the quarterfinals. Newtown’s win featured a strong performance by the defense, which didn’t give up any points until the final minutes of the third quarter. For Darien, the loss is the end of two streaks, as the Wave had won three straight Class LL titles and had reached the state finals in five consecutive seasons. Darien also hadn’t loss back-to-back games since 2007. Much like the loss to New Canaan in last week’s Turkey Bowl, turnovers were a big part of the Blue Wave’s downfall Tuesday. Newtown got a big boost on both sides of the ball in the first quarter. Darien’s defense had stopped the Nighthawks cold on the opening possession and the Wave took advantage of a short field to move the ball down to the Newtown 9-yard line. Newtown stepped up and held Darien on fourth-and-goal, as a host of Nighthawks burst through the line and tackled Sam Wilson at the 5. Newtown then covered 95 yards on 14 plays, converting four third-down plays and scoring on a 3-yard run by Dan Mason. Darien fumbled the ensuing kickoff, with the Nighthawks’ Matt Dubois then recovered a fumble on the ensuing kickoff, setting up Newtown at the Darien 23. On third-and-11, quarterback Luke Melillo scrambled and found Riley Ward for a first down inside the five, and Mason scored again, this time on a 2-yard run, to make it 13-0 early in the second quarter. A 32-yard field goal by kicker Devin O’Connell made it 16-0 for Newtown in the second quarter before the Wave finally got on the board courtesy of the defense, as Wilson blocked a punt out of the end zone for a safety with 2:37 left in the half. Newtown got the ball back and marched downfield behind Melillo, with O’Connell kicking another 32-yard field goal to make it 19-2 at halftime. Darien’s defense stepped up the pressure in the second half and gave the offense a chance to rally. Quarterback Cooper Hancock connected with Peter Bredahl for a 25-yard TD pass with 1:01 remaining in the third quarter, cutting the deficit to 19-9. The Wave had one final gasp when Hancock hit TJ Cornacchia for a 29-yard TD strike with 3:52 remaining, but Newtown put the game away with a time-killing drive, capped with a 10-yard scoring run by Mason with five seconds on the clock. Mason’s touchdown was the 32nd of his career, setting a new program record for the Nighthawks. Joe Pagett, Newtown. 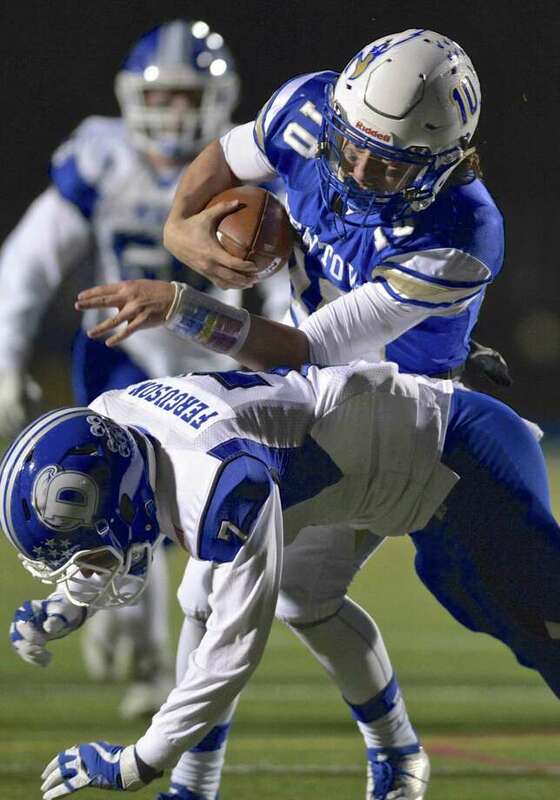 The strong safety led a huge defensive effort which kept the Darien offense off the board for the first 37 minutes as Newtown gained control of the scoreboard. He also had a fumble recovery when Darien muffed a punt in the fourth quarter, and blocked a PAT attempt when the Wave scored on its final drive. “For us, we’ve got to ride the momentum. We’ve got to clean up the mistakes and get ready for a good Greenwich team.” — Newtown head coach Bobby Pattison.